Bare Urea Gel containing 40% urea allows debridement of mycotic nails in a safe, easy and effective manner. Urea is also known as carbamide and it is one of the most basic and important chemicals used in healthcare industry today. It is an organic chemical compound that was first synthesized in 1828. Bare Urea Gel with 40% urea effectively debrides the diseased nail while leaving healthy nail intact and unaffected. Urea Gel It is widely used by podiatrist to treat patients with thick, mycotic nails. To naturally treat the fungal infection of the nail, Bare 40 urea gel also contains natural therapeutic ingredients such as tea tree oil, Aloe vera and green tea. Bare 40 Plus Hyaluronic Acid combines the benefits of Hyaluronic Acid and Urea topical gel. Salicylic Acid exfoliation using BARE 40 Plus Salicylic Acid is a great way to soothe severe skin conditions. Podiatrist sees urea as an effective and safe treatment modality for numerous dermatologic disorders. The use of urea for the management of damaged, devitalized, dystrophic and mycotic nails is well documented. Urea applies keratolytic and moisturizing effects by breaking hydrogen bonds. This subsequently loosens keratin and increases water-binding sites. This makes urea an ideal choice to soften keratin and treat psoriasis, eczema, corns and calluses. Urea is particularly helpful in treating thick, dystrophic fungal (onychomycosis) nails. Due to urea’s keratolytic effects, physicians have used it in the treatment of onychomycosis. Urea functions to soften the nail plate, which can enhance the passage of antifungal medications to the underlying nail bed. Several studies have shown that the application of 40% urea and salicylic acid to the dystrophic nail plate under occlusion can produce successful chemical avulsion of dystrophic nails. It is possible to perform chemical nail avulsion with urea in patients with onychomycosis, thus removing pathologic nail tissue and facilitating the treatment of the nail bed with topical antifungal agents. The safety and efficacy of urea in numerous dermatologic disorders is well documented. With keratolytic and moisturizing mechanisms of action, urea is very useful in the treatment of both skin and nail disorders. An abnormal looking nail can be chemically removed by the use of Bare Urea Gel containing 40% urea. Carefully apply the gel to your nails, cover them and let them be that way for a night. Wash the gel in the morning and repeat application daily after you file the nail down as per the instructions. The nail plate will dissolve in about 2 weeks. The painless treatment using urea 40% removes the abnormal, damaged, devitalized and ingrown nails. It also gradually removes the fungus from the affected nail area. With this treatment you don’t have to take tablets or go through surgery. Trimming and thinning techniques make the fungal nail infections less painful by reducing the pressure on the nails. Trimming the nails also has the effect of enabling the Bare Urea Gel to reach deeper and be more effective. Before trimming the nails, you need to soften them up. Apply the 40% urea gel in the night and wash them in the morning with soap and good water. Keep doing the same maneuver until the nails soften up. Use a mild soap or cleanser to wash the skin or nail area to be treated. The moisturizing effect works better if Bare Urea Gel is applied while the skin is still damp after washing or bathing. Moisten a cotton swab and apply a thin layer of urea gel to the affected skin. When applying Urea Gel to the nails, avoid getting any medicine on the cuticles or surrounding skin. Apply generously to the nail and allow the medicine to dry. You may cover the nail with a bandage or gauze if your doctor advises. The treated nail should be easily removed after several days. Apply 40% Urea Nail Gel to damaged nail tissue or affected skin area(s) twice a day or as directed by a physician. Bare 40 Urea Gel gently dissolves the intercellular matrix of the nail plate, which results in loosening the horny layer of skin and shedding of scaly skin at regular intervals. Urea 40% gel, thereby, penetrates the nail to soften hyperkeratotic nail units, facilitate nail debridement and remove infected fungal nail. It is ideal for patients with multiple nails affected. The moisturizing urea gel is designed to remove dead damaged, devitalized and ingrown nails. The Bare 40% Urea Gel penetrates the nail softening the nail making it easier to remove the infected nail. 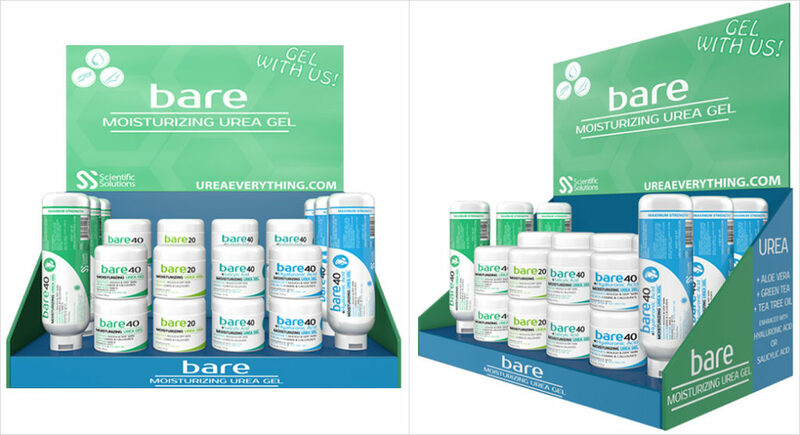 Podiatry specialists recommend Bare 40 Moisturizing Urea Gel to remove dystrophic nails without surgery. I wish to know what type of urea is used in this formula? Can you tell me? I have a friend that might benefit from this. She has this issue and is always embarrassed by her toe nails but doesn’t want to take the drugs her doctor recommended because of possible liver damage and side effects. This will be really helpful information for her. Thanks for sharing I would love to try this out. Thank you for the information. I will check this out.